The Natyacudamani of Somanarya is an unpublished musicological work written in Sanskrit and is accompanied by a Telugu commentary. The author of this work is Astavadana Somanarya who is said to have lived during the reign of King Acyutarya of the Vijayanagara Empire (1540 AD). The Telugu commentary seems to belong to a later period. The present edition is brought out with the help of fifteen manuscripts. 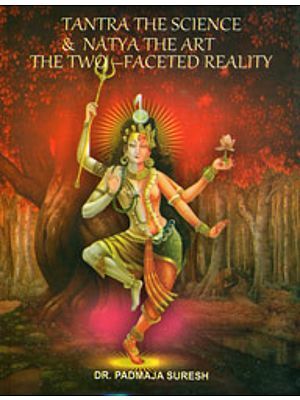 Though the title reads Natyacudamani, the available text mainly consists of chapter of Gita and Vidya and only a few verses relate to Natya. Somanarya’s work presents some of the traditional musicological views in a tangential manner and it has made a strong influence on many later works of South India. 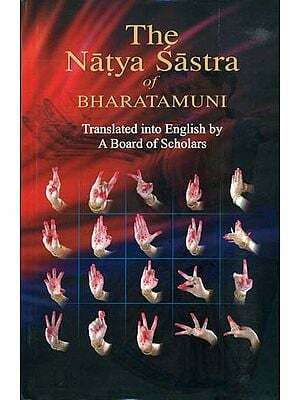 The origin of texts in performing arts in India can be traced to Natyasastra, It is a magnum opus that inspired later scholars and experts to write on different art forms like drama, music, dance, painting etc. Its influence on later writings on art all over India, from Kashmir to Kanyakumari and from Gujarat to Assam is indisputable. Sixteenth century in Indian history has been a period of extreme intellectual activity. Literary works in all forms, be it creative literature or theoretical works on criticism, artistic genres etc. were written during this period in different languages. Natyacudamani is one such work of sixteenth century which is attributed to Somanarya. The extant manuscripts of this work contain three chapters dealing with Natya, gita and vadya. The editor of this text feels that the original name of the work must have been Natyacudamani and the chapter on Gita or probably the commentary of this chapter was called Svararagasudharasa. She also feels that Sangitaratnakara was a additional title given to this work and that the text originally must have been called Natyacudamani. This is a work in Sanskrit with Telugu commentary but the commentary might have been composed at a later date and might not have been a part of the original text. The present critical edition has been done on the basis of fifteen manuscripts some of them on palm leaf and others on paper. Three scripts, Devanagari, Telugu and Grantha have been found which are a proof of the popularity of this text as well as the wide geographical area in which it must have been read. This text has been extensively quoted in later works of music. Dr. V. Premlatha is suitably equipped to edit such text, with her training in music as also the knowledge of Sanskrit language. She has done this work with due diligence and used a large number of manuscripts to critically edit the work of Somanarya. The National Mission for Manuscripts is happy to present to the scholarly world this text on music which will be useful in studying the development of Indian classical music as also the development of style of texts written on the same. This is second work on music that the Mission is publishing, the first one being a critical edition of Ragamava. I do hope musicians and scholars alike will find this text of interest to them. M/s Dev Publishers have done a good job of printing this text which contains text not only to Devanagari script but also Telugu and Roman script. Printing of critical edition of such a text requires accuracy. There may be errors in spite of all care that has been taken to avoid the same. The Mission would welcome comments on improvement of the presentation. Study of music manuscripts had been my area of research and as part of my Ph.D. I prepared a catalogue of manuscripts on music containing information from various sources. During my field visit to the Saurastra Sabha, Madurai, which is famous for the Valajapet collection of music manuscripts, I came across a palm-leaf and a paper manuscript titled Sangitaratnakara of Somanatha(narya). On studying the contents, it was found that this work was different from the Sangitaratnakara of Sarngadeva and it contained a few peculiar concepts, noticed in many later works. This led me to make a detailed study of this unpublished work. The name Somanarya occurs in Music literature from the 16th century onwards. He is known to be the author of Natyacudamani, an unpublished work available in the form of palm-leaf and paper manuscripts in different libraries. Only three chapters of his work are extant, namely, those dealing with natya, gita and vadya. The work is accompanied by a Telugu commentary. The present study has revealed that Somanarya's work has three different titles, namely Natyacudamani, Sangitaratnakara and Svararagasudharasa, Though the manuscripts are differently titled as mentioned above, Natyacudamani must have been the title of the original work and the chapter on gita or the commentary to the chapter on gita was called Svararagasudharasa. Sangitaratnakara appears to be only an additional name given to Somanarya's work in order to get credence. Further the Telugu commentary seems to have been composed at a later period, as concluded by a study of its contents and the literary style. Search for the manuscripts containing the text of Somanarya, finally left me up with fifteen manuscripts, available in the libraries of Chennai, Tanjavur, Madurai, Tirupati and Mysore. Some were palm-leaf manuscripts and the others were paper transcripts, written in Devanagari, Telugu and Grantha scripts. Copies of all the fifteen manuscripts were obtained, collated and edited according to the general rules prescribed for Textual Criticism (by scholars like S. M. Khatre). The edited text includes the suggestions or emendations of the editor noted within ''. The variant readings from all the sources have been given in the footnotes. In the course of collation, it was discovered that this work spoke of certain new concepts and presented certain old concepts in a form that deviated widely from the traditional understanding, presented by some of the popular works. Hence, though the manuscripts were highly corrupt with grammatically defective readings, it is attempted to make a critical edition with translation, in order to assess the contribution of this work in the background of the Indian Musicological tradition. The readings in some of the transcripts show that there had already been attempts to correct the text. 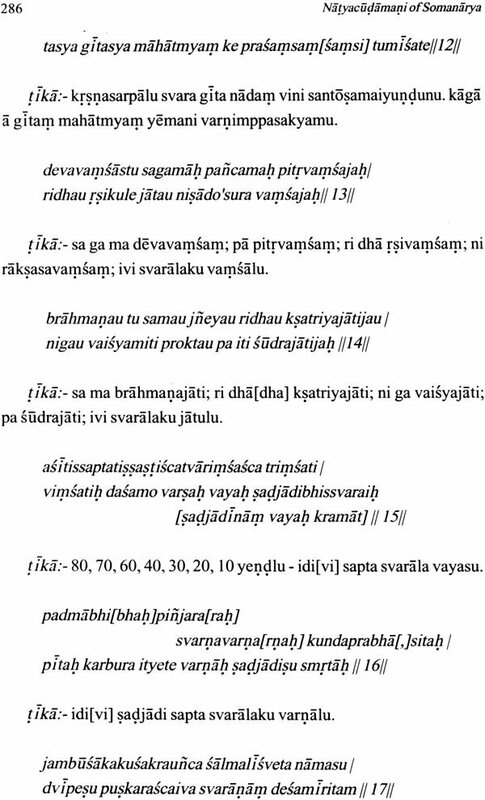 Some extracts presented in the Abhinavabharatasara-sangraha of Mummadi Cikkabhupala correspond to Somanarya's work. Many later works like Mahabharatacudamani Bharatakalpalatamanjari, Rasikajanamanollasini-Sarasangrahabharata etc. show close resemblance to the work of Somanarya. It is also found that a few verses in the Sangitamakaranda of Narada exist verbatim in Somanarya's work. All the works seem to be aware of both the mula and the commentary, as evident from the readings found in them. 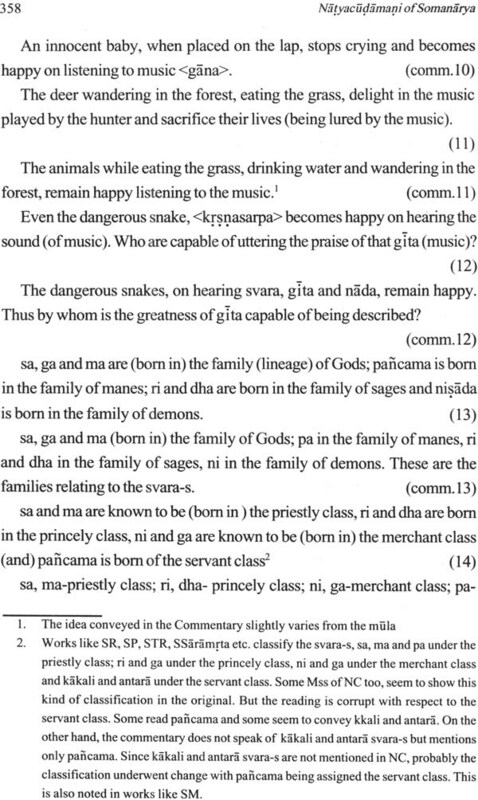 It is also interesting to see that all these works had extracted mainly those concepts spoken in the chapter on gita. These works were of immense use for the edition of Natyacudamani as secondary testimonia. This multi-faceted task has yielded a tentative text and an English translation. Efforts have been taken to remove the discrepancies and to strengthen the text as a whole. Finally the study of those musicological traditions that preceded Somanarya in time and those that were contemporaneous with his work, were useful in portraying the musicological stand-point of Somanarya as a trend setter. There are some shortcomings in Natyacudamani from the musicological point of view. For example, there occurs no table of contents or proper colophon statements indicating the scope of the work. The topics are not arranged in the usual order as seen in works belonging to other musicological traditions. Though many terms have come from earlier sources, the delineation of their concept reveals a tangential approach and great deviations from accepted interpretations. Finally the whole style of musicological presentation in this work is of the 'Listing' and 'Classifying' kind rather than descriptive. No attempt to present a homogeneous picture of a musical system is evident in this work. The present edition begins with a critical Introduction which includes a detailed discussion of the manuscripts of the work, title, author and date of the work, various aspects of Lower and Higher Textual criticism and the influence of Somanarya's work on later works. The second chapter consists of the edited text of Natyacudamani in Devanagari script and the Telugu commentary in Telugu script with the variant readings from the source manuscripts in their respective scripts given in footnotes. Notes on the readings, emendations etc. are also given in the footnotes. A small portion of the text was considered ambiguous and hence has been placed towards the end of the work titled, "anubandha". The third chapter gives a Roman transliteration of the mula and the Commentary and the fourth chapter is a rough English translation of the whole work. Attempt has been made to present only a verbatim translation, in order to get the real picture of the work. I express my sincere gratitude to Dr. N. Ramanathan, retired Head, Department of Indian Music, University of Madras for his scholarly guidance throughout this research work. I am grateful to Prof. R. Sathyanarayana of Mysore for his valuable guidelines on textual criticism and for lending me the copies of rare works. I thank the librarians and other staff of the Government Oriental Manuscripts Library, Chennai, Taryavur Maharja Seifoji's Sarasvati Mahal Library, Taryavur, Saurashtra Sabha, Madurai and Oriental Research institute, S.V. University, Tirupati for getting me the copies of manuscripts for this edition. My sincere thanks to the Late Y.R. Swami, Professor Chinni Krishnayya, Mrs. Hema Ramanathan and Dr. Rajalakshmi for assisting me in the edition and translation of the work. My heartfelt thanks to Prof. P.V. Ramachandran, Miss. V. Sireesha, Dr. V. Sathyavati, Mr. J. Udaya Bhaskar for their kind assistance. I thank the University Grants Commission, New Delhi for awarding me the Junior Research Fellowship (1995-2001) to carry out research and the University of Madras for granting me permission to publlsh my Ph.D. dissertation. I wish to convey my sincere gratitude to the National Manuscripts Mission, New Delhi for taking up the publication of this work.